With out a Doubt, St Josephs Catholic Church in Seattle Wa is one of the cities most beautiful Churches. We were truly honored to be part of this wonderful ceremony. The day was cool and rainy and the dome above this couple was very blue. 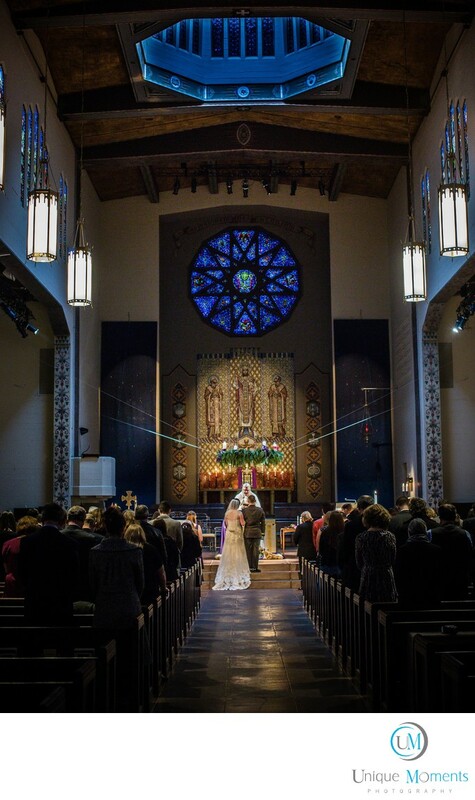 We enhanced the color to match the back stained glass window and used the natural light in the venue and the spots that illuminate various areas in the church to create this image. This church is spectacular in every way and we would love to photograph here anytime we can. Volunteer Park is less than 4 blocks from the church and its a great location to get the bridal parties to for pictures. Ceremony time at this church is very tight and for this wedding we only had 3 1/2 hrs total time to capture formals, the ceremony and to exit for Saturday afternoon confessions. Clients should be prepared to work quickly and take advantage of some of the surrounding areas o popular dates. Location: 732 18th Ave E, Seattle, WA 98112.